An Introduction to Wudang - The China Taichi Guide is a Directory of Tai Chi Schools & Tai Chi Teachers in China. 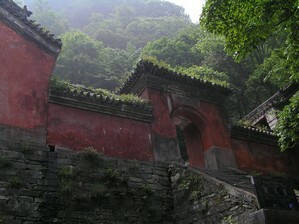 Wudang is one of those place that exists in the myths and legends of China as well as for real. There are often references made to it in martial art films, usually mentioning some secret technique etc. 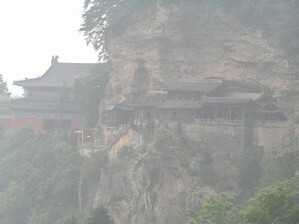 Wudang town itself is not really special, it serves your basic needs and is OK. The mountain however is a really beautiful place. The practice here is really Wudang Kungfu, not Tai Chi, but its also an internal martial art and some of the forms are called 'Tai Chi'. The foot movements were different to anything I've seen before. There are many places to study around this area and again this is the kind of place where you can meet some interesting teachers. 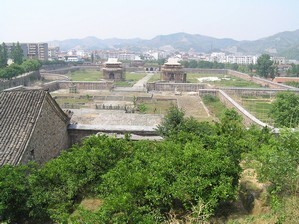 Quite close to the town centre I found the huge old Yuxu temple, allowing a glimpse of Wudang's historic past. Next to the temple is one of the main Wudang Gongfu Schools and they train in the temple itelf. It was very popular with international as well as Chinese students and I liked the atmosphere there very much. Wudang Mountain is a really beautiful area. The views from high up are great, and I have to say that once I left the main tourist centre and started exploring the various paths through the forest, I loved the place. The 'nature energy' here felt great and I really enjoyed my walks. There are beautiful old temples all over the place and I only went to a few of the main ones leaving much to explore for the future. Some of the temples cling to the rock faces and are great to wander through. The walk up to the highest temple on the peak and the Golden Hall is quite a hike, and involves going up an awful lot of steps. My knees started to hurt so beware if going up and down - the cable car might be more comfortable one way at least. The main centre, high up the mountain, although a bit touristy, is not too bad, at least when I was there in May. There are a few hotels to stay in, and I bargained down a small room to 100Y. There were quite a few options on place to eat, so this isn't an issue. 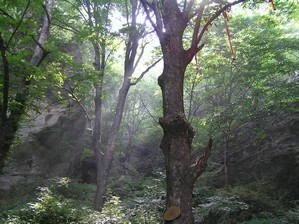 There is also a 100Y entrance ticket for Wudang Mountain area to pay. 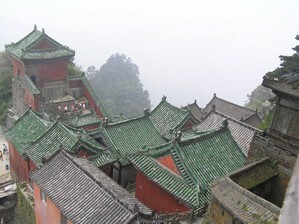 Wudang is a short train journey from Xiangfan in Hubei Province. There are good train connections to Zhengzhou & Beijing in the North, Wuhan in the East, Chengdu in the West and Nanning / Liuzhou in the South so its pretty easy to get to. A simple guesthouse is available just in front of the station in Wudang Town, down an alley on the left, and good cheap food was easy to find near there as well. Accommodation is also available on the Mountain. Internet cafes are scattered around the town, ask for 'Wanba' and there is a Bank of China which takes cards. So no worries on the basics. All in all, Wudang Mountain is a really interesting place and is well worth a visit, whether as a 'Tai Chi' tourist or to check out teachers to train with. I barely scratched the surface. I'd be grateful for more information on the schools and teachers here as there seems to be a lot going on. The China Taichi Guide : An Introduction to Wudang. 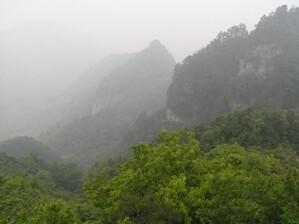 Wudang Mountain is famous in China's history as the mystical home of the Taoist Internal Martial Arts. Its a beautiful area to visit combining natural beauty with monastic temple history. The China Tai Chi Guide is a directory of Tai Chi Schools and Teachers in China.